Find out how Kavita Shukla, this year's keynote speaker for Natural Products Business School, overcame her doubts and launched the award-winning, internationally distributed company FreshPaper. It’s rare that a middle school science fair innovation can launch a young inventor on a lifelong path of world-changing entrepreneurship. But if there’s one thing you should know about Kavita Shukla, this year’s keynote for Natural Products Business School at Expo East, it is that she’s anything but ordinary. Shukla started developing her flagship product FreshPaper when she was just 12. She was inspired by a homemade beverage her grandmother gave her to stave off waterborne illness, and thought the special combination of spices in the drink could inhibit the growth of common bacteria and mold on fruits and vegetables. 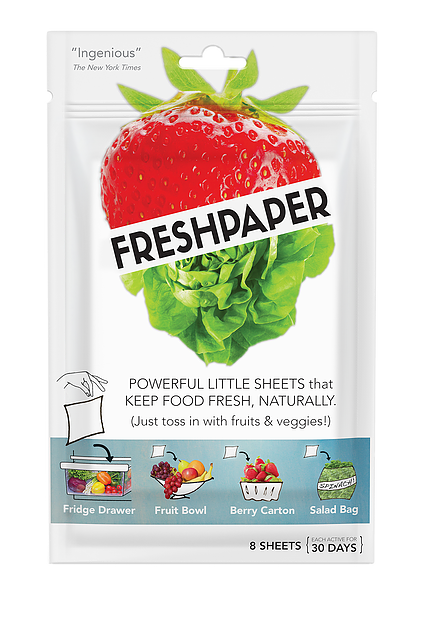 Infused with organic spices, when placed in your refrigerator drawer, fruit bowl, berry carton or salad bag, FreshPaper keeps food fresh two to four times longer. Like a dryer sheet for your produce, each compostable, maple-scented sheet lasts for a month, and is designed to reduce food waste. Shukla’s invention has received international acclaim. The recipient of the 2013 INDEX: Design To Improve Life award (the world’s largest prize for design), Shukla is now helping to get FreshPaper into organizations that need it most—food banks, where extending the life of almost-past-their-prime fruits and vegetables for even a couple days can make a big difference. Such work has placed her on Forbes’ “30 Under 30” list. She was also named to TIME Magazine's "5 Most Innovative Women in Food." Here, learn more about Shukla’s entrepreneurial journey, and how she hopes FreshPaper can drastically reduce food waste across the globe. Do you have a business philosophy? How did these principles inform your decision to launch FreshPaper? Kavita Shukla: Our mission is “Fresh for All”—we believe that fresh, healthy food should be accessible and affordable for everyone. FreshPaper actually began as my middle-school science project, inspired by a home remedy that my grandmother in India once gave me to drink. As a child, I wanted to build a non-profit to bring FreshPaper to the developing world. I created FreshPaper for use in communities where refrigeration was not an option (over one billion people live without access to electricity). After several years of trying and failing to get my idea off the ground, I finally brought a handmade batch to my local farmer’s market. I was amazed by the response—I started to realize that reducing food waste was a universal need, and that we could build a social enterprise to scale the technology and make it more accessible for all. What do you attribute to the success of your business? KS: We started with $300 in paper-making supplies—we had no funding and no experience. What began in my grandma’s kitchen sparked a movement that took me and my simple idea to places I could never have imagined. Within a few months of that first day at the farmers market, we were shipping wheelbarrows of FreshPaper across the country from our tiny local post office (sometimes making it shut down for hours)! In less than two years, I went from worrying about if my credit card would be declined while buying paper cutters at Staples to worrying about how to make millions of sheets to meet the demand worldwide. Today, FreshPaper is on the shelves of retailers across the globe from Whole Foods to Walmart, and available in over 180 countries. Our unlikely story was made possible by all those along the way who, when I was ready to give up, showed up to take this idea one step further. From my high school teacher who believed that this idea was more than just another science project, to our earliest supporters at the farmers market who started a grassroots movement that took FreshPaper global. At every step, when we least expected it, someone took a leap of faith to support us. Chris Durkin at the Harvest Co-op in Cambridge, Massachusetts, was our very first retail customer. Tony Russo, a third-generation farm stand owner showed us how to build a business from the ground up. Bill McGowan from Whole Foods looked at my handmade sheet of FreshPaper and saw its potential as a consumer product even before I did. I still think about how those moments changed the trajectory of this idea. Running a business in the natural industry can get pretty gritty. What keeps you going when the going gets tough? KS: Not a day goes by when I don’t think about how all of this almost didn’t happen at all. Although as a child I really believed that I had discovered something that could help millions and take on global hunger, as I grew up, my mind started to tell me that I would never be enough to bring my invention to the world. Like many young women, I kept hearing that I needed more money, more degrees, more experts on my team—more than I had and more than I was. Standing in the farmers market that first day, sharing my idea, I began to overcome my own doubts, and the entire narrative of my story shifted. Entrepreneurship is all about persistence and showing up. Even on the really tough days, I try to remember how that first day at the farmers market changed my life, and that showing up and taking another step forward, no matter how small it may be, is the most important thing that any entrepreneur can do. What are the most pressing problems in the food industry today, and where do you see opportunities to mitigate these issues? KS: Today, despite all the technology we have, a third of our world's food supply is lost. While the world's farmers harvest enough to feed the planet, 800 million people go hungry every day, and over a billion people live without access to refrigeration. Simple, sustainable innovations that address the massive global challenge of food waste can make a huge impact in the food industry by reducing the tremendous water, energy, land and human costs associated with food waste. What excites you most about participating in Natural Products Business School at Natural Products Expo East? KS: I love meeting other entrepreneurs! I can’t wait to meet everyone and hear stories of what inspired them to bring their ideas to the world. What's your biggest piece of advice to entrepreneurs just entering the natural industry? KS: Just take the first step. And because most folks attending Expo East are doing so due to a deep love of food, if you had to choose one food to eat for the rest of your life, what would that be and why? KS: Bananas! I think they are the perfect food. Before my first live TV appearance on HSN, I was so nervous I couldn’t eat anything. My mom told me to eat bananas, and I had an amazing day. So now, when I’m in the studio I survive almost entirely on bananas. I just did a 24-hour live TV marathon fueled by bunches of bananas!